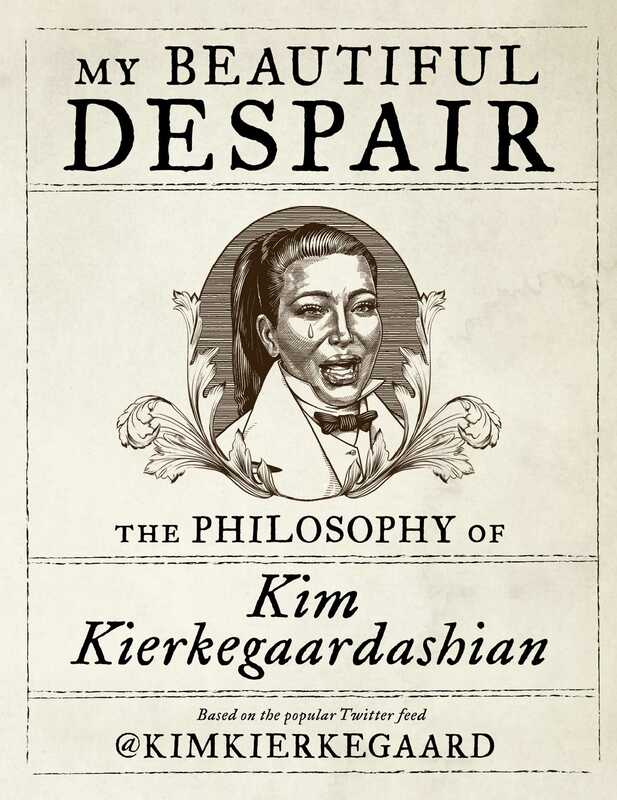 In “the ultimate meeting of the sublime with the ridiculous” (London Evening Standard) My Beautiful Despair blends the existential philosophy of Søren Kierkegaard with the superficial musings of Kim Kardashian West, based on the popular Twitter feed @KimKierkegaard. Kierkegaardashian shares thoughts on fashion, beauty, brunch, and the relentless waves of existential dread that wash over us day after day. – I have majorly fallen off my workout-eating plan! AND it's summer. But to despair over sin is to sink deeper into it. – Obsessed with protecting your skin, lips, hair & face from the sun? Close the cover of the coffin tight, really tight, and be at peace. – I like my men like I like my coffee: a momentary comfort in the midst of all my suffering. – What is the operation by which a self relates itself to its own self, transparently? Selfie. – What if everything in life were a misunderstanding, what if laughter were really tears? Scared LOL!! – I’ve been going to bed a little bit earlier each night, to get a taste of death. In an age where the line between news and entertainment is blurrier than ever before, and the difference between a celebrity and the leader of the free world is nil, Kierkegaardashian’s insights perfectly reflect our absurd, hilarious, and deeply disturbing new era. @KimKierkegaard has been admired, praised, and adored in The New Yorker, The Washington Post, The New York Times, Financial Times, The Economist, New York, Buzzfeed, and more, and has amassed nearly a quarter of a million Twitter followers, including J.K. Rowling and Anna Kendrick. Now in a humorous, illustrated gift book, perfectly suited for our existential times, Kierkegaardashian’s philosophical insights are juxtaposed for the first time with Dash Shaw’s brilliant black-and-white illustrations. Kimberly Søren Noel Aabye Kierkegaardashian West. Her/his/their original comedic voice(s) has/have been credited with inspiring two successful off-Broadway musicals, numerous imitation Twitter feeds, and at least one very bad Halloween costume; and Buzzfeed predicted, albeit probably wrongly, that she/he/they will be “the only lingering legacy of Kim Kardashian’s fame.” Born in Copenhagen Denmark, they live in Los Angeles, California. For more information, look first in your own soul. "every bit as enlightening and hysterical as it sounds."